How to cook buckwheat correctly? 1 How to cook buckwheat correctly? 2 How to cook buckwheat garnish? Boil buckwheat are able to all, but the result is not correct in every. Ideally, cooked cereals should be crumbly and dry. In fact, there are rules, how to cook buckwheat. First of all, Need to know, what dishes to cook buckwheat. The pan should be thick wall. Ideal - the cauldron. Why? The cauldron cereal does not stick well and steamed. Secondly, it is important to be able to properly wash cereals. poorly, if during a meal, the teeth will grind trash. so, wash. Pour buckwheat in a container, fill with water and gently agitated by hand. Husks and grains of black float. water drain, It will merge with it, and all unnecessary. By repeating this several times. What's next? Pour buckwheat a kettle and add water. Need to remember, that in the process of cooking, barley increases 2.5 fold. poured water, add a little salt and butter. The oil can be put, and after, like porridge cooked. To cook buckwheat leaves 15 minutes. It is advisable to check the degree of readiness. Dip a spoon in the middle of porridge, a little set aside and see, Are the water. If yes, then let a couple of minutes Cook. Everything, mash ready. How to cook buckwheat garnish? How to cook buckwheat, understood. For garnish you can use buckwheat, which is already packaged in sachets. In its many shops. In this case, the proportions are not important. The pan pour water. When it boils, solim, omit package. Through 15 minutes take out his, uncover and pour in dish. garnish ready. For porridge can add meat, spices and oil. Very convenient for single use. In the finished porridge add the stew and stir. You can just put out the buckwheat with stewed meat and vegetables in a pan a few minutes. 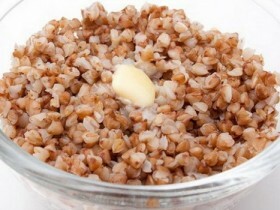 A great way, how to prepare a side dish of buckwheat without cooking. In thermos pour cereal, pour boiling water, to close and leave for the night. In the morning breakfast is ready. 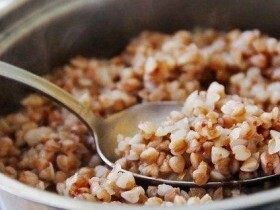 Buckwheat is not only used for garnish. Buckwheat soup, too, turns out delicious. knowing, how to cook buckwheat, boil the soup is not difficult. Cook soup with chicken broth, on mushroom broth, but you can just water. Preparations of cereals is the same as a side dish. The only difference is in the amount of. On 3.5 liters of water falls 150 grams buckwheat. rebuked broth, add the potatoes, minutes later 15 pour cereal. Five minutes before the end of cooking soup, laying zazharku. Was brought to reflux. The dish is ready. by the way, in the soup can be used chaff. Experienced hostess advised, to get a tasty soup, good grain fry in a dry frying pan. About tom, how to make buckwheat in multivarka watch the video below. How to cook turkey fillet?